The EE371 and EE372 from E+E – an Austrian manufacturer – are meeting the need for more extensive monitoring of dew point temperature in air systems and dryers. Using a special monolithic measurement cell, type HMC01, with an autocalibration procedure, the system achieves a measurement accuracy of +/-2C Td. Designed to reduce cost in straightforward applications, the EE370 series is direct mounted into a pressure fitting, with rating to 20 bar as standard and 100 bar as an option. The housing may be fitted with a digital indicator, and rotated with respect to the mounting point to improve display visibility. 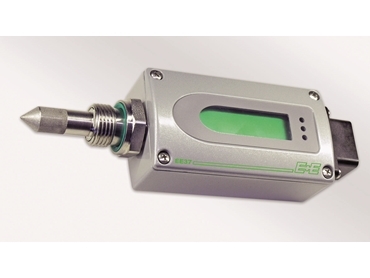 Version T has two freely selectable and scaleable outputs for dew point, frost point, or ppm volume concentration. Version S has two relays for control and alarm purposes. EE371 dew point transmitter / switch has a measuring range from –80 to +60C Td and EE372 ranged –40+60C. Configuration is made easy using optional PC software and communications cables. E+E manufactures the capacitive sensors used in these models, and in addition makes sensors for air velocity [thermal mass flow], RH, CO2, and water in oil. The EE370 series of compact dew point transmitters / switchs is available from ECEFast .